In Okinawa, karaoke isn’t so much of an option as it is a requirement. If you have friends who are local to the region, you WILL spend quite a bit of time singing into a microphone whilst trying to keep up with words on a screen. Since i like karaoke about as much as i enjoy being beaten on by 80 year olds with knobby canes, i tried to avoid singing at these functions at all costs. And when forced to – i chose the only song available that i didn’t feel i would destroy – one “Mack The Knife”, performed in the style of Bobby Darin. When relating this story to my ex, she stated (innocently enough) that if i liked that song, i might want to give the rest of his stuff a listen. Open mouth, insert pill, swallow. To me, Bobby Darin had what no other performer did. He had a deadline. He knew he wasn’t going to last long, so he made every beat count (well, up until the 70’s, but the 70’s almost single-handedly destroyed music – the adult contemporary style at least). His style of finger poppin’, gotta-make-it-count-the-first-time-cause-you-might-not-get-another-chance attitude comes through in damned near every song – even the ones that are slow. He didn’t just sing the song, he felt it. He didn’t just love music, he lived for it. And in so doing, he brought music to life for the rest of us. I humbly hope that one day I’ll be able to do the similar-to same with my writing. And that’s what’s with all the Darin love. It’s “Beyond the Sea” for me :)) I went through a phase of just listening to that song on repeat. Lovely voice and phrasing. Jo-Anne, I might have just married you, had I know you then =) That song has a permanent place on my mental radio’s playlist. 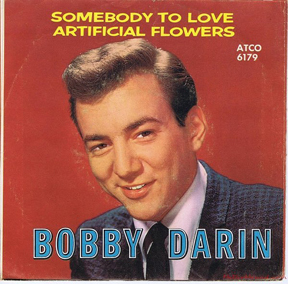 I love Bobby Darin, too, and only realized over the last decade or so how great he was. Terrible loss. It’s “Beyond the Sea” for me too :)) Brings back many childhood memories.Sits high in my music vault.